Wow! I know it’s been a while since I last wrote a post, but I have an excuse. I just got back from a mini-vacation which came right on the heels of our cruise. Early this Spring some friends from church and I had been yakking about going white water rafting sometime. Well, the “sometime” was earlier this week. We headed up to West Virginia early (very early, 6 AM early) Monday morning in order to get there for our afternoon Canopy Tour. Doesn’t that sound nice? Canopy Tour. Maybe like hammocks hung in the trees or eating little sandwiches. WRONG! It was an extreme zip-line, sky bridge and rappelling nightmare. Did I mention I’m afraid of heights? The highlight of this tour was that I finished it. Alive!!!!! Well, we did have nice guides, Cullen and Katie who tried their best to make us feel comfortable 100 feet in the air. Oh, and thanks Cullen for shaking the last sky bridge so much. That only added to my sheer terror delight of it all. Would I ever do it again? You know, that’s a great big no maybe! Well, about 1 minute into the trip I realized I LOVE WHITE WATER RAFTING!!!!! Every rapid is different and our guide Chris (the best guide ever) gave us clear and easy to understand directions on how we were going to take each rapid. As we approached the first rapid, everyone on the tour was told to get out of their rafts and swim through the rapid and then get back in their rafts. The point of this little exercise is to see if you are comfortable “saving” yourself. If you were not comfortable, there was still a chance to exit the tour. After swallowing half the New River, I did make it to my raft. There was a little problem though, I couldn’t hoist myself up and in it. Never fear, Chris to the rescue. He grabbed each of us by the life vest, hoisted us out of the water and tossed us into the raft. So much for dignity. I was flailing around inside a slippery, rubber boat that seemed to be moving at the speed of light. Laughing hysterically didn’t help either. Well, I had to be hoisted again later in the trip when I decided to join a bunch of other people and jump off a big rock into the river. Since I lost all of my dignity after the first “hoist” I really didn’t have any to lose this second time. 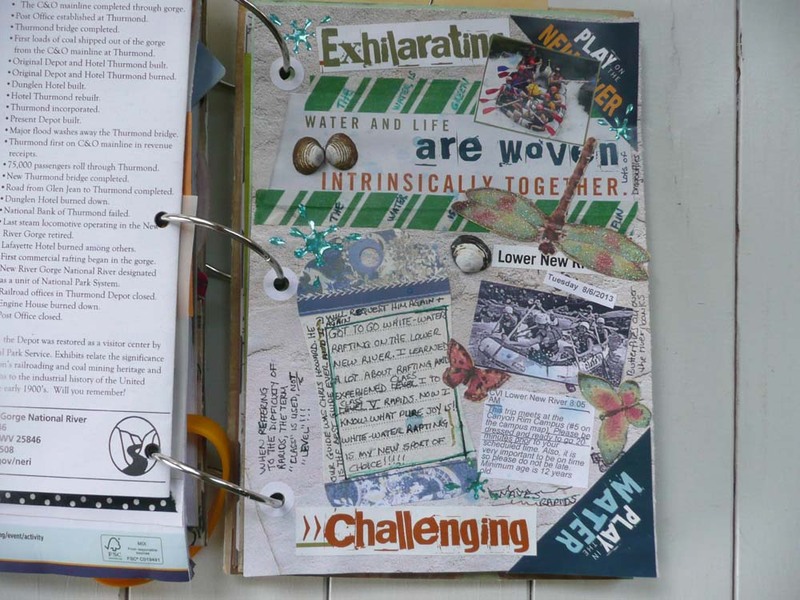 It did, however, inspire this page for my art journal. This post could go on forever (don’t worry, it won’t) because I have so much to say about white water rafting. The bigger and stronger the rapid, the more I like it. I actually experienced PURE JOY while rafting. I’ve got the bug. That’s all I can say. So here is a page from my smash book about my rafting adventure. I love the flailing arms and legs=) absolutely what it felt like. Great job on the post. It’s been wonderful getting to share this with you. Judy, I’m glad we got to experience “pure joy” together. I’m already looking forward to next year. Lower New River AND Lower Gauley! That’s awesome! Lol! You go girl!